Phyllis Chen is an accomplished pianist, both on the full-sized concert instrument and on the pint-sized toy piano. In addition to her frequent appearances with the International Contemporary Ensemble (ICE) as a composer and performer, she is also the Director of the UnCaged Toy Piano Festival, which she started in 2007 to expand the interest in and repertoire for this captivating instrument. The 2013 festival will be held December 12-14 at several venues in New York City. How did you personally become infatuated with toy piano and other toys and/or unconventional instruments? I’ve played the piano since I was five years old and found the toy piano as an adult. I came upon my first instrument at a puppet theater in Chicago. It wasn’t presented to me as a musical instrument. It was in a stage set that I happened upon and heard its beautiful sound. I fell in love with it instantly, not only for its bell-like sound, but for all the potential I saw in this unexplored instrument. The toy piano is really an extension of me as a pianist, but with the opportunity to stretch and explore new dimensions of myself as a performer. I first became interested in composing in large part because of my constant exploration of the toy piano, which led me to articulate a sound and genre of music that I did not feel existed on the full-sized piano for me. Pieces written by me and others for toy piano often include other unconventional instruments, turning the pianist into a multi-instrumentalist, more like a percussionist, juggling various miniature objects during a performance. Other instruments I use often are metal kitchen mixing bowls as gongs, music boxes, and other found objects. My most recent unconventional instrument is a dilapidated zither that I setup like a miniature prepared piano. How did UnCaged Piano get started and what have been some of the highlights of prior festivals? UnCaged Toy Piano started in 2007 as a call-for-scores to create more repertoire for the toy piano. 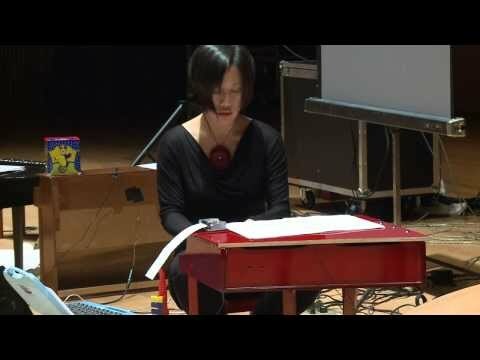 In 2011, we hosted our first three-day UnCaged Toy Piano Festival in New York City, featuring nine performers, including Margaret Leng Tan (who’s returning this year), Japanese improviser Takuji Kawai, David Smooke, and others. We played to three boisterous full houses in three different venues. The festival is really a celebration of the toy piano movement that has truly begun. We’ve received over 300 score submissions since 2007 from composers all around the globe, ranging from South and East Asia to North and South America, and throughout Europe. There’s a growing interest in the toy piano and people have traveled across state borders and oceans to attend our festivals as both audience members and performers. We’re expecting to see more of the same enthusiasm this year! How does the annual UnCaged Piano “call for scores” work? Our call for scores has a defined theme each year, using the toy piano as the central instrument in a new work. A three-judge panel adjudicates the submissions and we choose which will be performed as part of the next festival. This process is always very exciting, challenging, and thought-provoking. I find that there is such a large range of musicians writing for the instrument because it’s new to everybody, placing no person or composer at a more advantageous position over another. We usually put out the call for scores in the spring each year and adjudicate in the late summer. What composers/compositions will be featured in the 2013 festival? This year’s festival embraces the multimedia and multi-instrument aspect of toy piano repertoire. Anthony Marasco, the 2013 UnCaged winner, built two homemade instruments. One of them is a plastorgan and the other is a harp, both are played not by hands but by wind. (We’ll be turning on some fans for the performance, so bring your coats!) UnCaged really embraces experimentation and we like to see where these risks take us. San Francisco-based sound artist Danny Clay (2012 runner-up) is creating an audio-visual collage piece that he made in collaboration with me and his third grade music students who created graphic scores in response to John Cage’s Suite for Toy Piano. I really love the inclusive nature of this project that will also highlight Danny’s musical aesthetic. It was fun to be part of the process and it’s going to be exciting to premiere a finished audio-video piece instead of a live performance. We will also present new works from the call for scores and from some really fantastic NYC-based instrument makers. Brooklyn-based instrument builder Ranjit Bhatnagar will be showing his robot toy piano and “Speak and Play,” two invented instruments. We’ll also have Ken Butler’s light keyboard with spinning wheel. Terry Dame is building an installation made from old French piano hammers. Over the course of three evenings, there will be world premieres of 10 new compositions, including work by Lukas Ligeti (US), Anthony Marasco (US), James Joslin (UK), Yeung-ann Linn (Taiwan), Monica Pearce (Canada), Silvia Corda (Italy), Peter Koszeghy (Germany), Christina Oorebeek (Netherlands), Jorge Saenz (Mexico), William Johnson (US), Danny Clay (US), Jeff Brown (Germany/US), and Yvonne Freckmann (US). The festival has had some noted performers in the past, who will be the featured performers this year? People often ask me what they should do to be a better toy pianist, which I’ve always found to be an odd question. I think if you play the instrument, you’ll find solutions to playing it well. Some of the pieces in this year’s festival demand quite a lot of logistical problem-solving as well as multi-instrument playing. These pieces are new and the toy piano isn’t a paved path. I am excited to be joined by such talented and generous performers as Margaret Leng Tan, Kathleen Supove, Cory Smythe, and Tristan McKay to tackle some of these challenging and exciting new pieces. For our kick-off party on December 12, we will also hear a really special set of original songs by singer-songwriter Alexa Dexa who performs on a variety of toy instruments. What she does is really special and adds another perspective to the toy piano festival. Returning this year will also be Matthew Evans, performing some of his original pieces on toy piano.